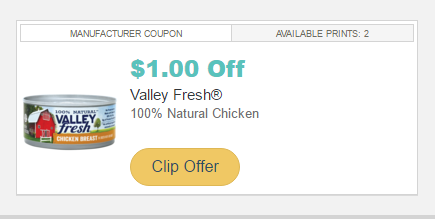 Savvy Spending: *HOT* Free Valley Fresh Chicken at Kroger, plus up to $8.75 moneymaker for new Checkout 51 members! *HOT* Free Valley Fresh Chicken at Kroger, plus up to $8.75 moneymaker for new Checkout 51 members! You can pick up some FREE Valley Fresh Chicken at Kroger! Final Cost: FREE plus a 75¢ moneymaker! Plus, NEW Checkout 51 members get a $5 bonus when they join HERE! And since the limit on the Valley Fresh Rebate is 5, you can get 5 for FREE (if you can print from a few computers), get $3.75 in Rebates plus get a $5 BONUS if you're a new members! So that's 5 free products, and you'll make $8.75 if you're new to Checkout 51! Sweet!